In my basement are 5 large boxes of files from 10 years of teaching. It used to be more, but I have been slowly condensing the boxes over the last 4 years. 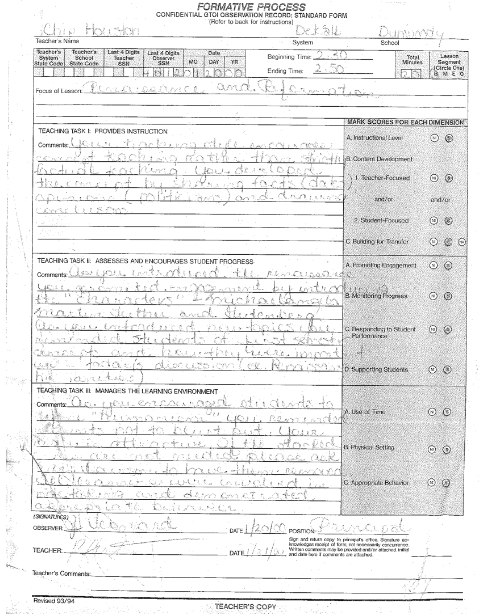 I was amazed to discover some old observation feedback from my first year at Dunwoody HS. It was fascinating to compare how I received feedback then as a teacher to how I capture and deliver feedback now as an administrator, especially as it relates to instructional rounds (#IRFEDU). Your students participated in the classroom discussions as well as the homework review. 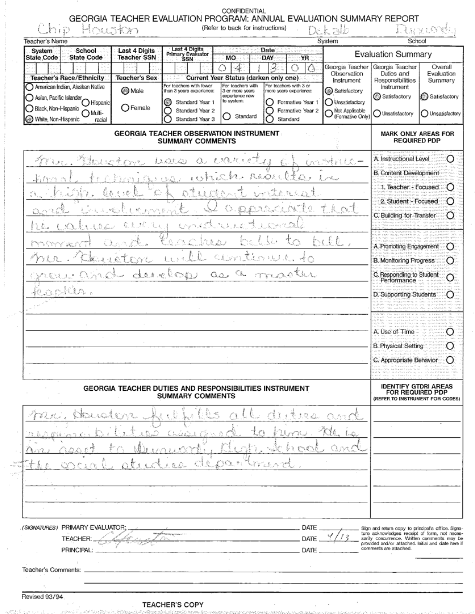 The student responses indicated the appropriate instructional level. By discussing genetics concepts of historical value and relating those to genetics of today (cloning) you built for the transfer of knowledge. 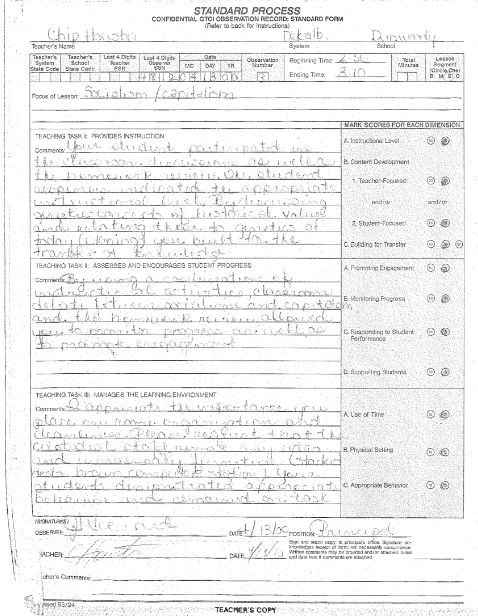 By using a combination of instructional activities, classroom debate between socialism and capitalism and the homework review allowed you to monitor progress as well as to promote engagement. I appreciate the importance you place on room organization and cleanliness. Please request that the custodial staff remove any extra and unnecessary furniture. (Stacked desks, brown computer station) Your students demonstrated appropriate behavior and remained on task. Your teaching style encourages concept teaching rather than strictly factual teaching. You developed the concept by sharing facts (dates), opinions (politicians), and drawing conclusions. As you encouraged students to define “humanism” you reminded students not to burst out. Your class is attractive. If the stacked desks are not needed please ask Mr. Davidson to have them removed. All learners were involved in note taking and demonstrated appropriate behavior. Mr. Houston uses a variety of instructional techniques which results in a high level of student interest and involvement. I appreciate that he values every instructional moment and teaches bell to bell. Mr. Houston will continue to grow and develop as a master teacher. Mr. Houston fulfills all duties and responsibilities assigned to him. He is an asset to Dunwoody High School and the social studies department.